“MILEY ITALIAN FUSION” operated by the famous Kinley Thai Bistro. is a Vespa inspired bistro serving Italian Fusion food, coffee and desserts. Miley Italian Fusion Bistro, serves authentic Italian plus asian-italian fusion food. Varieties of food include pizza, pasta, rice dishes, special desserts and Italiano coffee drinks. All our menu are priced affordably for everyone yet uncompromised in creativity, quality and taste. You will love our unique Italian Fusion menu created uniquely by Miley. As we created Miley, we believe that good food does not have to be expensive, so we made our menu affordable for everyone to enjoy. Check out our Miley Italian Fusion Bistro MENU and many customer reviews all over Instagram and social media. We are serving very unique Miley Pizza, thin and crispy with fusion taste, all the freshest ingredients, freshly cooked for you at Miley. You will find unique one of a kind pizzascreated by Miley. Apart from Pizza, authentic classic Italian pasta, we are also famous for unique fusion Pasta, like Thai Green Curry Pasta, Balinese Aglio Olio Pasta, All created by Miley. Diet will have to start tomorrow if you come to Miley, because we serve the best desserts in town. The first Miley Signature Sizzling brownies, Baby Ducth Pancake, Pavlova, Waffles, Waffle Stix, freshly baked Cookie Lava, Churros, Smores, Coconut Ice Cream, Fresh Mango Ice Cream and many more to choose from. Well, ngopi time can be arrange at Miley, because we serve you freshly brewed coffee from our specially selected organic coffee beans. Selected from the high mountains of Takengon, these gayo beans are specially blended to our company. We serve classic varieties from espresso, cappuccino, machiato and not to mention our unique Marrochino, double shaken espresso with honey or milk, Coconut Coffe and the Medan classic Avocado Espresso is also very popular. For tea lovers, nobody should leave Miley without tasting our unique Yin Yang Thai Ice Tea, Rose Tea, Lavender Tea with honey and more…. If you have visited our first bistro, you will remember Miley in Vespark that had a great facility for Vespa lovers to hangout, have coffee, good food and desserts. 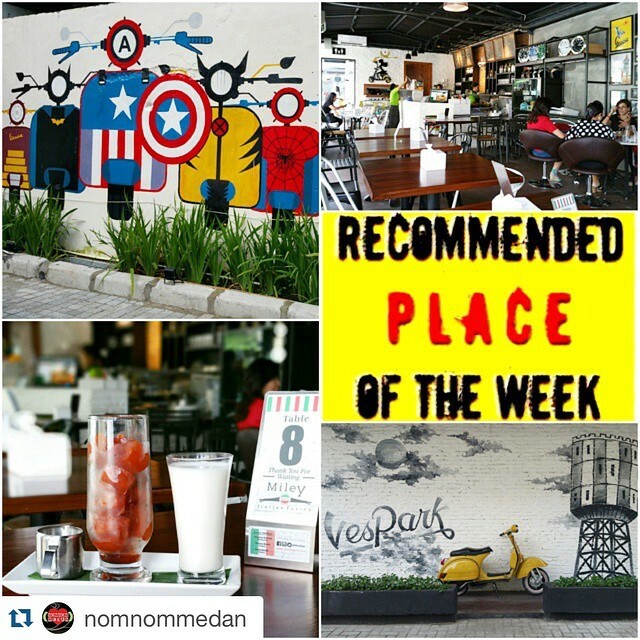 It is an ideal hangout place for Vespa riders, chatting over their love of Vespa while they wait for the Vespa to be serviced/attended to. However ,we have moved Miley to Sun Plaza Level 4 new culinary zone and have opened Kinley Thai Bistro at Vespark instead. Remember to follow our social media for promo and menu updates.